Remember the vortex streets? On Monday, people were complaining about the foggy morning. I hung the laundry out on the line (5 loads of desert trip and normal household maintenance laundry! ), confident that the marine layer would burn off. Here is the image from NASA's Terra satellite, which flies at 10:30 AM local time (11:30 daylight savings time). 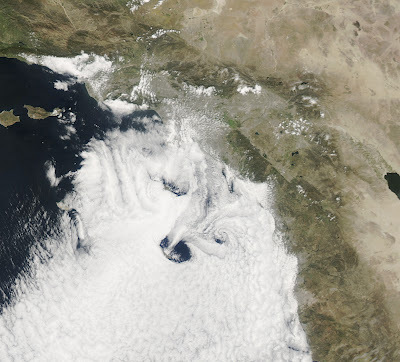 Can you make out the vortices coming off San Clemente and Santa Catalina islands? 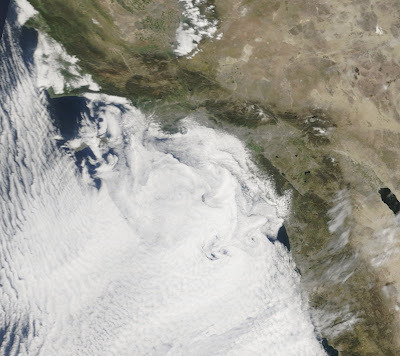 By the time NASA's Aqua satellite flew overhead at 13:30 local time (2:30 PM PDT), the fog had burned off the coast. The fog bank over the ocean had considerably thinned and you can see the islands more clearly. And the laundry dried just fine. Very tired, much laundry. It was a good trip. 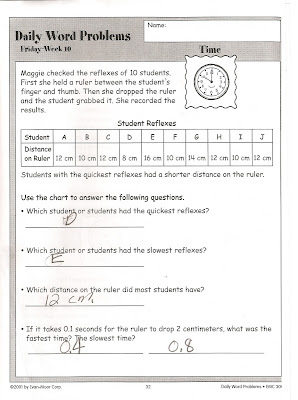 I know that they expect the kids to assume a linear relationship, but the numbers don't make intuitive sense. It's been a while since I did kinematics; Mark and I checked each other's work and agree. The ruler drops 2 cm in 0.1 seconds, giving you d and t. This gives you the information you need to solve for a, the acceleration due to gravity. You can come to only one conclusion. Those kids aren't on earth. I don't think it can be Mars either. In other news, Iris wasn't able to read her school-mandated 30 minutes last night. We dragged her off to West Hollywood (WeHo) to help celebrate Birgitte's rockstar's 7th birthday. We saw their new Musical, Baby It's You. With all that driving, celebrating and singing and dancing, there was no time for her to read. She reads much more than 30 minutes on most days. She's read over six hours this week already. Mark wrote a note to the teacher explaining that. She was still punished and forced to sit out recess in the "opportunity room" today. WTF? I spoke to her teacher and she said that she asked Iris, "Were you unable to do the reading?" She meant that, if there was a valid reason, then all would be forgiven. Iris misunderstood and reiterated that she didn't read the previous night. Iris didn't notice the note that Mark wrote, and did not show it to her teacher. From the NWS KLOX area weather discussion page. I like it when people explain exactly what they know and don't know. Winds have an even more detrimental effect upon blooms than a slight lack of rain. They can parch and kill a budding plant in hours. (They can also turn a forest into tinder; high winds are an even better predictor of wildfire than high temperatures.) The high winds we experienced Sunday through this morning, and predicted to recur this Friday, means very, very dry plants. On Desertusa's Joshua Tree wildflower reports page, I was impressed with the methodology of two bloom hunters. Mar. 6, 2009 John reports: A look at rainfall data from the past six months (see http://www.wrcc.dri.edu/cgi-bin/anomimage.pl?cal6mPpct.gif) shows an anomaly of high rainfall near Desert Center, so on Wednesday I went off to explore this zone. Perhaps we should also be looking for places sheltered from the winds. 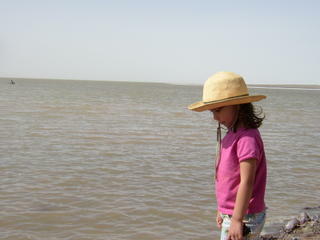 I will just have to repost pictures of Death Valley in March 2005, the record rainfall year. Iris walking through a patch of desert gold in Death Valley NP March 2009. Bad Dad outdid himself when composing this picture. Iris standing on the shores of the ancient dry lake Manly. Yes, that is a kayaker in the distance, and there were 30 more out there that day along with a windsurfer and several canoers. * The title is a bad pun on the title of this book. While going through my sister's archives, I found Yummy enough to eat from 2005. I never posted a proper photo of the completed, and much loved sweater. The wedges meet in a graceful curve at the hem. The shoulder and top of the sleeve don't work for me, but high end designers are showing weird peaky shoulders and sleeves this year. I will definitely made the Crystal Cove Pullover again. Gauge, about 18 stitches per 4" before wearing. The garter rib stretches downward. Perform decreases at the shoulder so that it follows my natural shoulder shape. Move the double sleeve decreases from the top of the sleeve to the underside. That will get rid of the peakiness. If between sizes, knit the next size down. The garter rib is very stretchy and sags a bit in the wearing. I knit the next size up, and ended up with a sweater that feels two sizes too large. This image was almost lost. 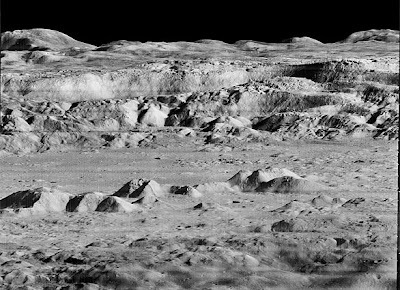 You can read about NASA archivist Nancy Evans battle to save these images and more, in LAT's NASA's early lunar images, in a new light. I am not surprised she applied for funding through the appropriate NASA channels each year to try to save the imagery (which resided on perishable magnetic tape), and was denied each time. Data preservation gets no respect at NASA (and most places). She would probably have had better luck if she applied to the Library of Congress, which does fund data preservation. If you have 10 minutes to kill, you may want to watch the video, Barriers to Innovation and Inclusion. That is, she has moved her blog to its own domain. If you subscribe to her RSS feed, you will need to resubscribe using her new blog address. She warned me that I might have to manually update all my past post links, but she performed a nifty trick with .htaccess. Big sis has a lot of tricks up her sleeve. Just in case you were thinking of performing your own manual Wordpress move, read her lessons learned prior to the move. In December 2002, my sister looked at Iris' striped pullover (made from yarn leftover from the hand sweater) and the Cable-wise not cashmere sweater WIP and asked me if I wanted a guest account on her fiber arts blog. You may want to visit the Fiber Musings archive of my 2003-2005 posts. See why she booted me off her blog for straying too far off-topic. And read my sister's spinning, weaving, knitting, natural dyeing and sailing adventures. CSA day will take place on April 4, 2009. Don’t miss out on this great day. We will have two times. 10am or 1pm. Let us know how many people in your family will be attending. There is no charge to attend for those families that are participating in the CSA program. We really enjoyed our first CSA box. It held two large containers of organic strawberries, picked that morning. Iris polished off half of them in the first two nights. Breathing Treatment dipped them in chocolate. We ate them plain. Iris actually ate lettuce! We found that the spinach, lettuce and radishes lacked the bitterness of supermarket produce. We don't know why, but we are happy about that. We look forward to our second box this afternoon. See me if you want a form to sign up for April deliveries. I wrote about this CSA program with site-specific info in CSA & Schools. Tanaka Farms' website has information about the CSA program and CSA newsletters with info about the farm and recipes. Our family befriended another family with a girl of similar age. Cell phone numbers and email addresses were exchanged. We even rode our family bicycle to their house in Venice (Venice Beach, not the city in Italy) for a play date. We were thinking of calling them up to ask if they wanted to reprise the trip when they beat us to the punch. We even managed to book the exact same cabin. Iris is looking forward to her private sleep loft. Perhaps she will have a sleepover. Mommy looks forward to stargazing from bed through the bay windows. in the restaurant at the inn. Since then, the water from the oasis has been used to grow vegetables for travelers arriving by stage coach, then rail, and now automobile. Which means they have been doing it a lot longer than the Obamas. But I am still glad that the Obamas plan to break ground on a kitchen garden tomorrow. Remember last year when I complained about how hard it was to view the stars with the full moon? We will be there near the new moon this year. This means we can go to the Hidden Valley Picnic Area at 7:30 (19:30) March 28 for stargazing with the Andromeda Society at one of their monthly star parties. Geology, flowers, hiking, rock climbing, astronomy, eating and playing. It doesn't get any better than that. Well, maybe we can start a knitting circle on our deck or around the pool or by the oasis. I learned to knit in the early 1980s. As the years went by, it became harder and harder to find good yarn. I took a 15 year knitting hiatus. Then I went to visit a friend on maternity leave. Her baby had come after the due date, so she had time to knit two sweaters for him using patterns from Wee Knits, the cutest knitting book I had ever seen. I had to make the hand sweater. She loaned the book to me as she doubted she would be able to knit and handle a newborn at the same time. The hand sweater came out a bit too short for Iris. I went to the library and found a Debbie Bliss book with instructions for a cute sawtooth edging to add length. Iris looked adorable in it. Isn't the sleeve detail lovely? I wish I had used something between the spendy Cashmere called for by the pattern and the cheap wool-ease I used. It would be a perfect everyday sweater in my favorite everyday yarn, Cascade 220. The acrylic in the wool-ease blend makes the sweater slightly clammy on humid days. The wool in the blend is also scratchy. A quality wool doesn't cost that much more. Don't make beginners' mistakes. Someday, I will knit the pattern again. And maybe the hand sweater, too. I gave the first hand sweater to my friend's son at her memorial service. I wanted him to have it, in memory of the afternoon we spent together, cooing over our babies and our knitting. When we visited Descanso Gardens in 2008, we saw the Edible EstatesTM garden taking shape. What a great idea. I had been running out of space in my kitchen garden raised bed for all the things I wanted to grow. I will just sneak edible plants into the rest of my yard. As you approach the front door, you will find some sickly looking lettuce. You can see swiss chard and chives in pots by the back door. I put some more swiss chard under the bay tree. See the foxglove digitalis volunteers sprouting from the plant that went to seed last year? We've been plucking leaves off a single head of lettuce since last October. It is finally going to seed now, but a smaller one sprouted beside it. There's more swiss chard in the bed, along with beets, Nantes carrots, cilantro, fennel, green onions, garlic chives, and volunteer tomatoes. The view from our flower bed, toward the vegetable bed. I snuck some more swiss chard amid the flowers. I fear I may have planted too many. A coworker says he and his wife have been harvesting leaves off a single swiss chard plant for an entire year. Even if we don't eat them all, they are pretty. When we went to Disneyland last Friday, we noticed that Disneyland also plants edible landscapes. Do you think they serve salads harvested on site? Rosetta hid amid the roseates shapes of kale. When we visited Descanso Gardens last weekend, we learned that the Edible EstatesTM garden was a temporary exhibit and has been taken down. However, the students of Cal Poly Pomona will plant a new edible garden this Spring in the Sundial garden area. Sadly, Fritz Haeg has trademarked the term, Edible EstatesTM and Descanso Gardens will have to call it something else. Perhaps the Disney and Haeg lawyers can fight it out and annihilate each other? We discuss instances where correlation does not imply causality a great deal at Chez Badmom. A year ago, Sandra Tsing Loh asked me to write up my observations comparing Iris' school 3 blocks east of us to the school she would have attended if we had bought a house 3 blocks west of us. It's a bit late, but she's not paying or grading me. It helps if you read what she has to say about school statistics. http://greatschools.net is the easy-to-use, test-driven school listings resource visited by one in three U.S. K-12 families (30 million users). While the compilation of data is incredible, greatschools.net has an unfortunate “one number” rating system, based (essentially) on a school’s API score as averaged over the entire student body. This number which correlates most strongly with homogeneous populations of affluent families and high real estate values (in the same way SAT scores are strongly linked with family income). Parents tend to wrongly conclude they must move to an expensive suburb (where starter homes are $1.2 million) to find quality teachers for their children. As luck would have it, the 2008 average home prices in 90266 and 90278 (as estimated by ESRI) are $1,188,703 and $845,655. Don't faint. Our neighborhood is still a bit rough around the edges and some people won't even visit it after dark. LA is just plain expensive. Let's call the school in the expensive suburb school A. Greatschools.net gives it a 10 (out of 10) rating and school B, Iris' school, gets an 8. The academic performance index or API, is another one number school summary. The two schools receive 943 and 885 respectively. Which peer group would you like to buy for your kids? (You are not buying an outcome, only a peer group.) The one with the higher achieving kids? Before you shell out $1.2 million for a shack near school A, take a closer look at the numbers. * No comparison can be made for 5th graders because the sample size at school B is too small. I am posting details for only the Math scores because the English scores don't show such a strong pattern. Kids at school A score slightly better in English, but I suspect it is because no students in school A are English learners. The average English scores for grades 2-4 are 412 and 409 respectively. 3 points is in the noise, but a math gap of 26 points is significant. The difference is even more striking if you know that school B allows any child who will turn 5 before the December 2 cutoff date to enroll in Kindergarten. School A requires that any child born in the Spring, Summer or Fall be evaluated for 'Kindergarten readiness'. Kids in school district A are a half year older than kids in school district B. (One September birthday child from school district A attends school B because the principal insisted she repeat Kindergarten until she gained more reading fluency!) Kids in district A are also more likely to have attended academic preschools, have hired tutors and a quiet place to study. If you rely solely upon Greatschools.net, you will never learn this stuff. Go visit your neighborhood schools. Talk to some kids, parents and teachers about what they like and don't like about their school. I am not advocating that you try to enroll your kid in school B. Instead of chasing high test scores, I believe that concerned parents should channel their energy into helping to raise the quality of their neighborhood school. And you can't do that if you are killing yourself working around the clock to afford the most expensive neighborhoods. 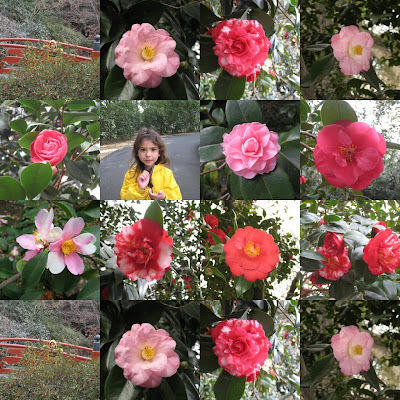 It's March and we haven't made our annual trip to the enchanted camellia forest at Descanso Gardens. Luckily, now is the perfect time. Camellias are in full force! Stroll the Gardens to discover lovely pink, white and multi-colored blooms high in the canopies and blanketing the ground like snow. If you think camellias are finished by the end of February, think again. Join the experts from the Pacific Camellia Society as they show off the "late bloomers." 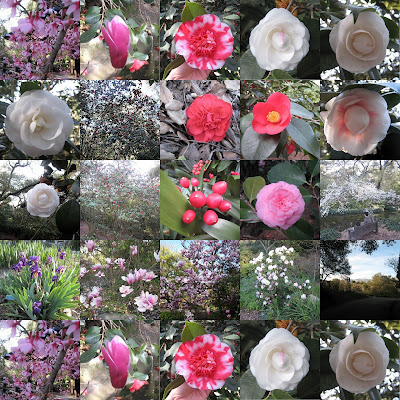 The Enchanted Camellia Forest from 2008. A Very LA Day from 2007. The weather has been kind this winter. It should be a very good show. From xkcd via UMBC ebuiquity. Before you learn how to drive, you learn how to be a baby. Actually, babies are born knowing how to learn. I forgot how complicated it was to be a baby. Watch and listen to Lisa Meeden from Swarthmore College as she speaks about Creating Curious Robots. The talk is streamed at http://www.ustream.tv/channel/umbc-ebiquity-meeting. Abstract: Applying machine learning to a robotics problem typically requires substantial human oversight to design the learning system, tune the parameters, define the task, determine the input and output representations, and create the training data set. In contrast, biological organisms are able to learn autonomously from unlabeled data in an open-ended fashion. Developmental robotics is an emerging field that strives to build better robots by applying insights from biological developmental processes. In this talk I will review several recent approaches from developmental robotics that use prediction to generate teaching signals. This results in a task-independent kind of learning in which the robot focuses on novel stimuli. The streaming video site is blocked at work; I was told to watch it at home. If you watch the UMBC ebiquity weekly talks in real time (7-8 AM in LA), you can type questions in for the speaker. I like attending seminars in my jammies. The part around minute 7, when she explains why we ignore the most familiar, was particularly worth noting. The UMBC ebiquity blog is also worth reading if you are interested in the technological stuff "under the hood" that is shaping the way humans interact with computers. The most recent talks are listed first at http://www.ustream.tv/channel/umbc-ebiquity-meeting. The talk before Lisa Meedan's may appear more arcane, but skip to minute 46 for a worthwhile discussion of net-neutrality and bandwidth throttling. The wash was full of blooming Wallace's Eriophyllum and chicory. Indians used to live here, as evident from this seed grinding hole. Palm Canyon (3 mi RT, 400' climb) is the most popular hike at Anza Borrego Desert State Park. We picnicked at the camp ground before our hike, which may not have been a good idea. It's an average bloom year, and the flowers are near peak. We had a great time! On the drive from San Diego to ABDSP, we saw blindingly brilliant patches of golden poppies and DYC (damn yellow composites) along I-8. And there was car knitting. Pix soon.